I literally saved about 50% of my original fare in UBER by doing this simple trick. And maybe, most of the time you can do this. The trick is simply to SCHEDULE your trip. Here's a photo demonstrating what I mean. 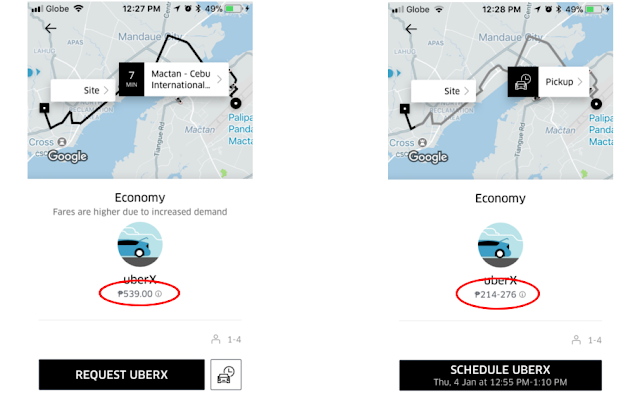 In the left photo, I scheduled a trip from the airport and as you can see, because of the demand, my fare ended up at 539 Pesos. Now, when I postpone my trip just about 30 mins or even less than that, I was able to bring down the fares to 276 Pesos. That's a pretty significant amount, isn't it? I don't know if it works on all locations but as for me, booking here in Cebu City, I can really see this significant drop. But I don't see any reason why this wouldn't be so in other cities. One may say though that the photo above shows that there's a surge in the left photo and none in the right. Yes that's true but even if there's no surge, the difference is pretty significant as well. Why not try and see it for yourself? Ride sharing apps such as Grab and Uber which heavily relies on modern technologies such as mobile and location services has been on the rise. Uber pioneered this kind of service when it was founded in the United States in 2009. Uber now operates in 633 cities worldwide and companies with similar services have also risen up in different parts of the globe. One notable company, Grab Taxi from Singapore, initially offers taxi hailing service but later on went ahead and offered Grab Car, an Uber-like service. Now Uber and Grab dominate the growing Philippine market for these kind of services.